What is twinning? What is it all about? And is it important? TAM is a voluntary organisation committed to encouraging links of all kinds – cultural, educational, sporting etc – with Mumbles’ twin town, Hennebont, a historic market town of some 15,000 people near the city of Lorient in Brittany, with which our village has been twinned since 2004. From September 2019, Mumbles will have a second twin town in Havre de Grace, a historic coastal town in Maryland, USA. By bringing people together from different parts of Europe, North America etc., twinning offers opportunities to share problems, exchange views and understand different viewpoints on any issue where two communities have a shared interest or concern. It can enable young people to get involved with counterparts from a different country and to gain self-confidence. Importantly, it can help everyone to better understand what Europe is and means in today’s world – and where the future may lead us in our relationships with the rest of the world. Twinning provides many opportunities to make new friends, both in your own community and your twinned community, improve language skills, share interests, travel and learn. And twinning is a wonderfully flexible instrument. It can take place between small villages, towns, counties or big cities. It can focus on a range of issues common to both – or several – partners and can involve people from all backgrounds in the twinned communities. Usually, twinning between two towns involves four partners: the two elected local authorities, and a voluntary organisation of citizens in each town. There can be no meaningful twinning without the active participation of two sets of citizens. 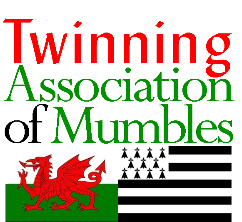 The two partners from Mumbles are Mumbles Community Council (MCC: the local authority) and the Twinning Association of Mumbles (TAM: the voluntary organisation). Hennebont has two similar partners, as will Havre de Grace. TAM is fully self-supporting and receives no revenue support from MCC. Occasionally, like all local organisations, it may apply for small grants to develop specific projects that will benefit Mumbles. We are always looking out for new members: individuals, families, clubs or associations of all kinds. Annual subscriptions are very modest and members’ meetings are collaborative and informal. We welcome people of all ages, particularly families. Or click here to go to the ‘Contact us’ page where you’ll find a link to a membership form to download or print. 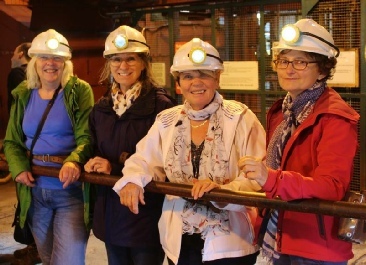 The visit to Big Pit in 2018. Two each from Hennebont and Mumbles… Photograph: Daniel Poulain. 10.30 am Monday 20 May: French discussion group at 6 Woodville Rd, Mumbles. Topic = Breakfast! Do you have photographs of Mumbles that show the beauty of the village during the different seasons? We would love to feature a changing selection in the white spaces around this website.